Interviewing The Lord Mayor of Chester isn't how this 'Mum who blogs' spends an average weekday morning. I think the last time I interviewed somebody was whilst I was at University, it was an 'actor' in a student play and we did tequila shots in a bar afterwards. Something I was pretty sure was entirely appropriate on this occasion. Despite my somewhat rusty skills and it being as far out of my comfort zone as it could get, I found myself saying yes to the exciting opportunity offered to me by @ShitChester. When we first started making arrangements for the interview I had imagined it taking place at the Town Hall. Our Lord Mayor walking briskly down the corridors dressed in his ceremonial robes and flanked either side by his assistants. They would pass him documents to read as we hurried alongside him taking notes. Yes, I clearly expected it be like something out of the West Wing. As we made our way up to the 5th floor of Council HQ with its panoramic views of the city, where our Lord Mayor made the @ShitChester team a coffee, I finally found myself relaxing. Our Lord Mayor, or Hugo Deynem as he was known for purposes of the interview took a genuine interest in the @ShitChester team and account, admitting that like some, he initially struggled with the name but now recognised it's place in championing Chester and all it has to offer, The fact that he took time out of his busy schedule and that he now follows over on Twitter, cements @Shitchesters place as a "Major force in Chester"
Hugo Deynem expressed his genuine sadness at leaving his position as Lord Mayor in May and what stood out to me throughout the interview was his passion for both his role, and for Chester. We take a look back at the past 12 months and all the highs and lows the role has bought, we also get a personal glimpse into what our Lord Mayor loves most about our fair City. So first things first, What do I call you ? If you were announcing me at a formal presentation or an event, it would be “The Right Worshipful Lord Mayor of Chester”.. But Hugo’s Ok for the interview! 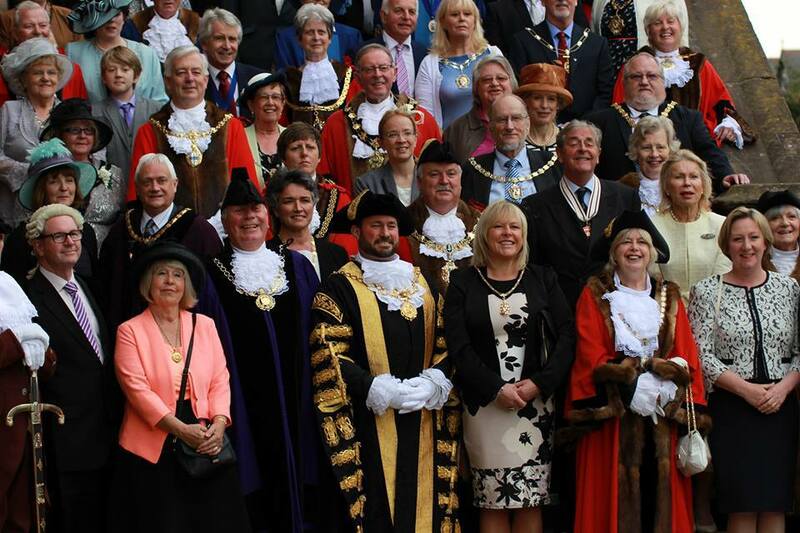 What is the job description of the Lord Mayor, and what is a typical day like for you? The job description is “First Citizen of the City”. As the First Citizen, if we have a foreign dignitary visiting, who do they actually meet, who is the face of the city? Is the Chairman, is it the Cathedral, is it somebody who runs the zoo, who is it ? The role of the Lord Mayor is the golden thread that ties all these groups and organisations together. Without that at the top you have quite a dysfunctional organisation. It draws it all together and works really well as a strategic process for handling visits to the city. How exactly do you get the role of "Lord Mayor of Chester"? The greatest criteria is longevity of service. It goes on a pecking order and you have to have been a councillor for a number of years before you are put before your peers and you are selected by your peers. Firstly you to go through the charter of Trustees committee. Its made up of members of the council who look after the civic role. That nomination then has to go through full council. For my civic role we have 2 charities for the year. We’ve got cancer research, we have OPAL- Older people’s active lives, they’re based in Kelsall. I’m a rural councillor and I do understand that social isolation in the rural areas can be extremely harsh. We have had some good fundraising events, the council employees have donated money from their quiz night and we have had some generous personal benefactors as well. Looking back at the last 12 months, what have been the highlights for you and have their been any lows? Its very difficult, and I do get asked this question quite a lot. As you can imagine with over 250 engagements up until now, to pull one out of the hat and say that’s the pinnacle of the term in office, would be unfair to all of the others. You could be shaking the hands of some muddy fishermen who have just done a sponsored rowing race up the River Dee, to sitting down to a very formal black tie dinner with lots of guests. They’re all incredibly different. The ones that stand out in my memory are ones where I have had an interaction or made a difference to someone’s lives. One that springs to mind is when I met a lovely lady who was celebrating her 90th birthday, we were visiting a residential home just outside Chester. It just so happened that she had been Lady Mayoress some 30 years ago, and of course she recognised the chains. I said “why don’t you pop these chains onto you one more time! ” We had some photographs, and the tears welled up in her eyes, she was thinking of her husband and all the fun she had years ago. That will stay with me for a long time. We had a lovely handwritten letter back from her. Another one that comes to mind was the presentation of medals to three very young children of a brave soldier who had lost his life in Afghanistan. Because of difficult communication links between the family and the army, a lot of the circumstances around the soldier’s death that the children didn’t know about. I wanted to deliver a presentation that did two things. One was to make sure that they understood fully what their brave father had done, and the circumstances of his death. I didn’t know what they knew or didn’t know. It was very difficult to write it and read it. The most intriguing income was a visit to the Critch memorial in Derbyshire. Its the memorial that the Mercian regiment had taken over as part of the recent amalgamation. It was a summers day and there were probably about 2000 people there. Lots of dignitaries. We had to line up on a long path that led up to this pinnacle. My Lady Mayoress was standing opposite me and as we got through this ceremony, with the Bishop reading out prayers, you know sometimes when you can see a blanket of rain… I could see a wall of black rain. 2000 people in shorts and T shirts and it just hit. The lady Mayoress to the left of my lady Mayoress was blown over, luckily she was caught by a Cadet. I was wearing my robes and I was soaked to the skin in 30 seconds! 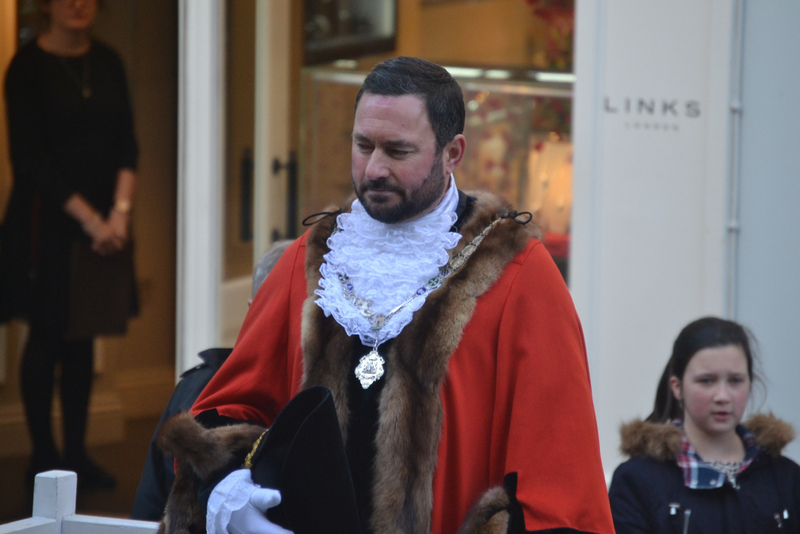 Tell us about split between Lord Mayor and Chairman of the council? It was disappointing for me. After 100's of years that role has now been split. Two roles and two budgets have been created, and it was purely done for political reasons. That’s not really the right way to change our civic history. What impact has it had on my year in office, very little. It’s just the impact its had on the civic role. While its right that we didn’t have a written agreement that the chairman always votes with the leading party, I don’t see why , if there had been a discussion, we could have put it in the Constitution. Having a Lord Mayor most certainly adds a prestige to an event, but do you think having titled roles like these still have a role to play in modern Britain, and is it worth the cost ? Without a shadow of a doubt. And that’s not just because I’ve been fortunate to take the role this year. I’ve already alluded to the fact that you need that person at the top of the organisational tree in Chester. If you don’t have it, the links start to collapse underneath it. Who pulls it together? Who showcases and promotes Chester for those that visit? Its essential we keep hold of the role. From a cost perspective, its not a huge cost. We get more Freedom of Information requests about the cars, but because they’re under contractual arrangement we can’t disclose what those costs are. They’re not as much as people envisage them to be, because there are flexible arrangements with the company that lease them to us. Both the vehicles are made in Cheshire, if we started running around in Toyotas or BMWs I can imagine the criticism we would get, particularly from people that work in the factories that produce those fantastic cars. You are well aware that we have got financial constraints from a budgetary point of view. The new administration here are looking at ways they can cut their cloth, based on the changes to the Government grants. Some of that will impact on the 3 civic roles (LM, Deputy LM and Sheriff).I would say that it is critical that we retain all of these roles, they are part of the fabric of Chester. How we fund that in the future, we are going to consultation shortly. We might be looking at putting a precept on the old Chester city boundary area. The sort of figures we are looking at are around 15 pence per month per household to fund. There may also be changes to the way we select our civic leaders, they will all then potentially sit within the Chester boundary, instead of Ellesmere Port and Weaver vale. Well I don’t personally miss Woolworths.. I did miss, and continue to miss the Gateway theatre. That was a tragic loss. We should have maintained it. But we have the exciting prospect of the new cultural centre, that will be a huge asset to the city. That would be my biggest regret having lost that , but its tempered somewhat now we have a new one coming onboard. I’m just a little regretful that I won’t be in a position to open it. From a city point of view , we have to make sure that we have that all encompassing offer. Something that gives them an afternoon of cafe culture, then going for a bite to eat, and then going to the cinema . Or vice versa, going to the cinema and making sure we have some restaurants open at ten o clock in the evening. Do you remember the last film you saw at the Odeon? We do miss the cinema. The last film I saw at the Odeon ? I hate to tell you, but it was probably Grease ! “I don’t personally miss Woolworths” On the 5th floor of CWAC HQ"
Regarding the plans for the Northgate development, are you championing the scheme ? You are passionate about our tourist industry. What do you think sets Chester apart? Its the breadth and depth of our history that we can draw upon. We can go back to AD 58 when the first Romans pitched up on the Roodee and decided to set up a camp. We can go through the medieval period, the Saxon period…we’ve got everything. I don’t think we utilise it as much as we should. We are great around our Roman history, but we have a lot of Saxon and Medieval that we could also use. The Sealed Knot did a fantastic job with the Civil War re-enactment last year. It’s not utilising that breadth of history that we have. But what you don’t want to do is dilute the message , if people think of Chester they usually want a bolted on image. If that’s Romans that great, if it gets them here. But once they’re here lets talk about the Saxons and the Civil wars and whatever else we might have. The thing I thing we don’t have is a must see paid attraction. We don’t have a Warwick castle or a Jorvik centre. We have lots of great free attractions.. the Cathedral, the museum, Chester zoo, the largest visitor attraction outside of London, not free obviously. But we don’t have that big draw . If you’re a family that wants to come and stay in a place like Chester for 2 or 3 nights. We need something to entertain mum and dad, the cultural centre.. we need shopping, which interests the family, we can do that in the Northgate development . But then what’s that family link? To my thinking it should be based around the amphitheatre, its under utilised and isn’t the draw that it should be. We have the challenge of Dee house that sits on top of it. I can remember talking about it when I joined Chester city council, in the 1990s it was occupied by BT. As far as I am aware no one has approached English heritage to ask if we can de-list this. If we could that would open up an opportunity. The second way is to use the building as part of the visitor centre. If we had something along the lines of a visionary interactive experience, the kids can see Gladiator and lions coming at them in 3D…You could enter it from the amphitheatre and build on the experience. My concern is , that because its up for change of use, it will become residential and we have lost it for 125 years. If someones visiting the city for the first time what are your 'must see' top 3 attractions? Grosvenor Museum, Cathedral, and the Heights of the museum.. and the third one would be the city walls. Its a great way to circumnavigate the city and take in all the attractions. If you have some spare time what do you like to do in the city? 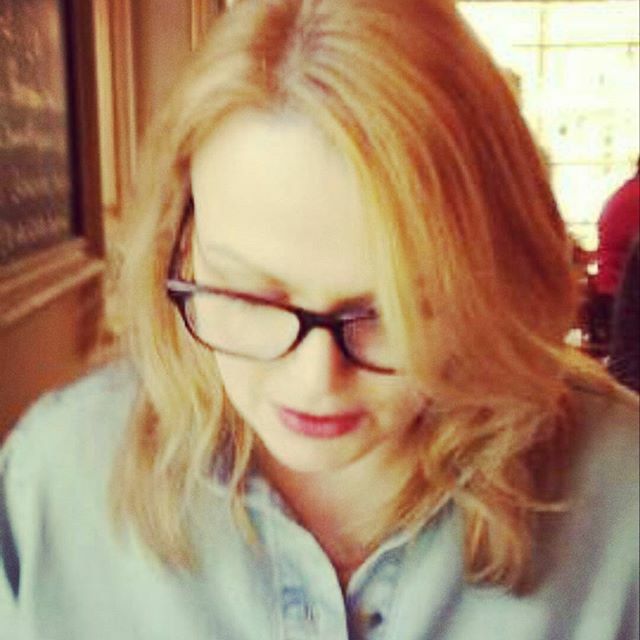 Eating out. We have some fantastic restaurants in Chester. We have the great news ones which have opened up in Pepper st. You can go from there to the Grosvenor or Edgar House , they have opened a new restaurant recently. Does being Lord Mayor bring with it certain perks? Do you get a free coffee in Costa, or if you’re parked on double yellow lines do they let you get away with it ? If only! There are certainly no financial perks of the job. We get the odd gift, a Chinese business delegation gave us a lovely plaque made from bamboo. But that goes back into the Town Hall and becomes part of the collection. Yes I do. You can see people looking at you, the longer you’ve been in the role . One thing that has surprised me is how many people want a photograph with the Lord Mayor! You have a presence on twitter. Do you enjoy getting involved in debates and do you get any trolls? Yes and yes. Rightly or wrongly I tend to tolerate trolls. Some people are just not particularly very pleasant. While there’s a part of me that says we should take that as par for the course, you’ve got to be careful how this leads into bullying and cyberbullying. It affects people differently. If you’ve got broad shoulders, it probably washes over you , some people are a bit more sensitive so we do have to be careful. What events have you got coming up ? The biggest one will be the St George’s Day parade. I have no idea what it involves, but it will all be in the best taste and great fun. These big cultural parades are a great way to showcase Chester. Where do you keep the Chains and Robe and do you take them home at night? If I told you, I’d have to kill you! They are kept in a secret location. "Because if you really want to look professional? You ask the Mayor for a selfie..."